CSUN (4-1) closed out the 2015 Kajikawa Classic with an upset over the host school No. 16 Arizona State (4-3) on Sunday to continue their hot 2015 start. Matadors starting freshman pitcher Zoe Conley had a roughing outing against the Sun Devil’s, allowing two runs and three walks in her one inning of work. Senior pitcher Brianna Elder would be called on to take the mound in her place to start the second inning tossing the last seven innings to grab her second win of the year. The nationally ranked Arizona State team and CSUN traded the lead in the early frames. The Sun Devils got to Conley early in the first inning for two runs. They would later add another run in third inning off of Elder to bring their lead to three. CSUN came storming back in the top of fourth courtesy of a big six run rally to grab the 6-3 lead. Down but not out, Arizona State strung together a rally of their own in the bottom of the seventh, plating three, to tie the game at six. Junior third baseman Maylynn Mitchell and sophomore outfielder Clarissa Sherman put the Matadors on top for good with a pair of runs in the top of the eighth inning. The victory was the Matador’s first against Arizona State since 2003, and their second win in the last eight contests against the Sun Devils. A couple of Matador’s had multi-hit games, with Mitchell picking up two hits on the day. Not to be outdone, junior shortstop Madison Fleming collected three hits and two runs, including CSUN’s last run of the game. Sophomore utility Taylor Nate supplied two RBI of her own off a pinch-hit single in the top of the fourth, scoring pinch-runner Sophomore pitcher Aliyah Ricks. Mitchell, who began the game with four RBIs in her previous four contests, added three RBIs on the day including the Matador’s go ahead run; on Monday she was named Big West Player of the Week. The Matador’s split their slate of evening games on Saturday against the Fresno State Bulldogs (4-1) and the University of New Mexico Lobos (3-2). 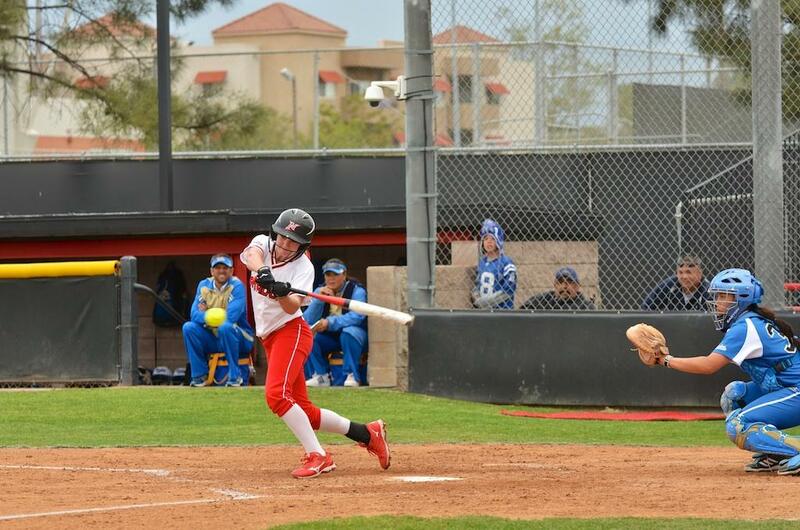 Against the Lobos, sophomore catcher Katie Hooper homered for the first time in 2015. Sophomore outfielder Taylor Glover collected three hits against the New Mexico pitching unit. Mitchell would drive home two of the Matador’s runs in their 5-1 victory. Next, the Matadors would face off against Fresno State in a losing effort, unable to hold on in a close 3-2 ballgame. Mitchell and Sherman would both collect an RBI in the contest. CSUN will head back on the road to participate in the Wilson/DeMarini Desert Classic in Las Vegas on Feb. 13th. Their first two games are scheduled against Portland State at 1:30 pm and a rematch against the New Mexico Lobos later at 6 pm.